Health service delivery in Lesotho is provided at three levels and these include primary, secondary and tertiary levels. In total, there are 372 health facilities which comprise of : 1 referral hospital, 2 specialty hospitals, 18 hospitals, 3 filter clinics, 188 health centres, 48 private surgeries, 66 nurse clinics and 46 pharmacies (Ministry of Health and Social Welfare 2016). The Ministry of Health together with the Christian Health Association of Lesotho (CHAL) own 213 of these health facilities. An estimated 90% of the private health facilities in Lesotho are located in Maseru, particularly in the Berea, Mafeteng, and Leribe Districts (Ministry of Health and Social Welfare 2016). Non Governmental Organisations (NGOs) provide additional health care services in the form of counselling centres, HIV testing clinics and reproductive health services (Government of Lesotho 2013). These NGOs include the Lesotho Planned Parenthood Association, the Lesotho Red Cross Society (LRCS) as well as the Population Services International (PSI) (Government of Lesotho 2013). Since 2008 the Government of Lesotho together with CHAL agreed to provide free health services to communities, especially those in remote rural areas. With CHAL serving over 30% of the Lesotho population, this resulted in an influx of patients who previously had minimum access to health services (Government of Lesotho 2013). Despite the country allocating 10% of its resources to the health sector, Lesotho continues to encounter challenges in health care provision (Morgan-Jarvis 2018). Affirmed by the United Nations Lesotho Country Analysis Report, the country’s investment towards the sector has failed to provide improved health outcomes for the population (UNDP 2017). The main concerns for the health sector are medical staff capacity constraints and the lack of adequately qualified health professionals. These challenges nest among other existing topographical and socio economic challenges in the country such as access to public resources particularly health care facilities (Ministry of Local Government and Chieftainship Affairs 2015). Within local government, the main challenge is maintenance, this is due to the lack of technical capacity at local government level to maintain existing health care infrastructure. This has resulted in strained resources as the Ministry of Health overseas the infrastructure planning, programming, design, procurement and maintenance (Government of Lesotho 2013). In an effort to improve human resource capacity, a Technical Working Group (TWG) was established in partnership with South Africa, United Kingdom and the United States in order to bring health professionals into Lesotho(Ministry of Health and Social Welfare 2016). The total population of Lesotho was recorded at over 2 million people in 2016 with approximately 61% of the population aged between the 15-46 years and 37.8% of the population under the age of 15 years, see Table 1 (Lesotho Bureau of Statistics 2018a; Ministry of Health and Social Welfare 2016). Additionally, the population aged above 65 accounts for 6.1% of the total population (Lesotho Bureau of Statistics 2018a). The 2016 Population and Housing Census estimated that on average, the life expectancy of males would be 52 years while females would be 60 years (Lesotho Bureau of Statistics 2018a). The young and the old are already a vulnerable group in terms of general exposure to health conditions, even more vulnerable under extreme climatic conditions. Source: Population and Housing Census 2016, Summary of Key Findings. According to the 2016 Vital Statistics Report, there were 9,655 reported births in 2016. The highest number of of births were in Maseru with 4,644. Qacha’s Nek is recorded to have the least number of births amongst all the districts with only 147 births (Lesotho Bureau of Statistics 2018b). With regards to the number of reported deaths, there were 13,768 reported in 2016. Of these deaths, 769 occured in South Africa. Maseru was reported to have had the highest number of deaths with 4,088 deaths and Qacha’s Nek had the least with 307 deaths (Lesotho Bureau of Statistics 2018b). Overall, there has been a considerable decline in the number of infant deaths from 94 deaths in 2006 to 59 deaths per 1,000 live births in 2014 and a further decline to 53 children dying per 1,000 births in 2016 (Lesotho Bureau of Statistics 2018a). Due to socioeconomic factors such as access to healthcare, early childhood mortality rates have been reported to be higher in the rural settlements than the urban settlements, see Table 2 below. Furthermore, trends indicate that there is a direct relationship between the education level of the mother and the childhood mortality rate. The higher the mother’s education level, the lower the childhood mortality rate (Lesotho Bureau of Statistics 2018a). The main cause of death for males and females for the past five years has been HIV and Aids. Lesotho experiences the third highest HIV infection rate in the world (Ministry of Health and Social Welfare 2016). The increase in the prevalence of HIV/AIDS from 23% to 25% between 2009 and 2014 has resulted in higher morbidity and mortality rates (Lesotho Meteorological Services 2007; Ministry of Health and Social Welfare 2016). In addition to HIV and AIDS, tuberculosis, pneumonia and anaemia are amongst the main causes of death for males and females. In 2015, 460 deaths were from HIV and AIDS, over 300 deaths were as a result of tuberculosis. Approximately 150 deaths were caused by pneumonia, 139 for diarrhoea and 108 deaths reported for heart failure (Ministry of Health and Social Welfare 2016). Future changes in climatic conditions could worsen or introduce various diseases. Although Lesotho’s National Climate Change Policy (2017- 2027) states that no climate related diseases have been recorded or pose as a threat to the country, it is worth noting that some of the causes of death are due to diseases which are airborne (e.g tuberculosis) and can easily be transmitted through extreme climate conditions (Lesotho Meteorological Services 2017). Respiratory Tract Infections, diarrhea and pneumonia are all conditions that are environmentally influenced. Furthermore, the main causes of death for children below the age of 13 years were malnutrition, pneumonia and diarrhoea, which are all predicted to be exacerbated with changes in climate (Ministry of Health and Social Welfare 2016). Access to clean water is crucial for the health sector. A lack of clean water resources and poor access to sanitation can result in increased incidences of water-borne infections such as typhoid and diarrhea. Water quality can be affected by climate change, especially in cases of flooding and extreme storms, impacting on the incidences of these types of infections. Furthermore, the availability of water resources may be of a concern as climate change may result in decreases in rainfall, prolonged drought conditions, and subsequently a shrinkage in surface and ground water availability (Lesotho Meteorological Services 2007, 2017). Although Lesotho has an abundance of water resources, adequate access to clean water resources is a challenge, especially in rural areas. According to the the Lesotho National Health Strategic Plan, in 2009, 90.1% of people in urban areas had access to improved water sources in comparison to 72.5% of people in rural areas (Government of Lesotho 2013). Types of water sources in Lesotho include water connected to the house or on-plot standpipes, public standpipes, boreholes, protected wells or springs, and rainwater collection (Lesotho Meteorological Services 2017). 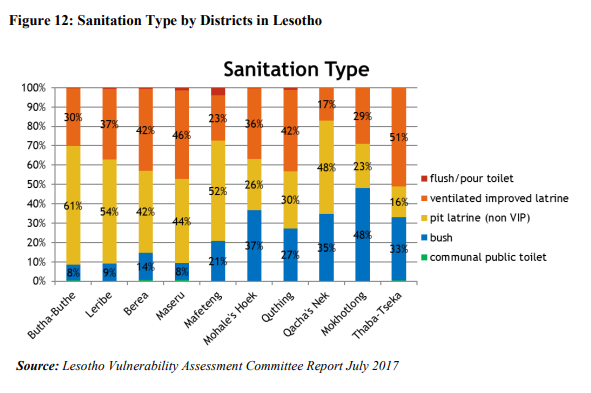 Lesotho’s National Climate Change Policy highlights poor sanitation and access to water as a key climate related challenge in the country that will increase the risk of disease, such as diarrhoea (Lesotho Meteorological Services 2017). In terms of housing infrastructure, Lesotho’s urban areas are experiencing rapid rates of urbanisation, with approximately 70% of Lesotho’s urban development comprising of informal settlements which are often unplanned and without access to basic services (Ministry of Health and Social Welfare 2016; Ministry of Local Government and Chieftainship Affairs 2015). People living in these informal settlements are particularly vulnerable to climate related hazards. Informal housing structures are more likely to be destroyed in storm and flood events and can result in injuries and deaths, and people are more likely to get water borne diseases in settlements where water and sanitation services are not provided. In terms of energy provision, the type of domestic energy used in households can pose negative health impacts, such as indoor air pollution. Only 20% of the country’s population have access to electricity. A total of 66% of the total energy consumed in Lesotho are biomass fuels ranging from fuel wood, shrubs, animal dung, and crop residue (Ministry of Local Government and Chieftainship Affairs 2015). With regards to cooking, 49.2% of urban households utilise gas while 65% of rural households use wood for cooking (Lesotho Bureau of Statistics 2018a). burning these types of fuels indoors can lead to respiratory illnesses, including pneumonia. In terms of employment, only 10% of Lesotho’s labour force is employed in the formal economy with the remaining 90 % working in the informal economy. Many of the informal types of work take place outdoors,such as agriculture. With the expected increases in temperatures from climate chnage, this may result in many informal workers being exposed to extreme weather conditions and result in heat stress and other related illnesses (UNDP 2017). Malnutrition is linked to food insecurity and Lesotho is highly dependent on its agricultural sector for sustaining livelihoods. Agriculture is a climate reliant sector and in the event of climate change, crop availability and variety will change and are predicted to result in increases in cases of malnutrition (Lesotho Meteorological Services 2017). Food security is already a significant challenge in Lesotho and as a result one-third (33%) of children under 5 years of age are stunted, with 3% suffering from cases of acute malnutrition (wasting), and 10% are underweight. Anemia appears to be a particular concern regarding malnutrition as more and more of the population suffer from iron deficiency due to a lack of food with iron. It is estimated that more than half of the infants ( 6-23 months old) are anaemic with 27% of women and 14% of men age 15-49 also anaemic. Climate change has already been identified as one of the key contributors to food insufficiency and insecurity in Lesotho (Lesotho Meteorological Services 2017). Government of Lesotho. 2013. ‘Health Sector Strategic Plan 2012/13-2016/17’. April 2013. http://www.nationalplanningcycles.org/sites/default/files/country_docs/Lesotho/19_04_2013_lesotho_hssp.pdf. Lesotho Bureau of Statistics. 2018a. ‘Lesotho Census 2016 – Summary of Key Findings’. Maseru, Lesotho: Lesotho Bureau of Statistics. http://www.bos.gov.ls/2016%20Summary%20Key%20Findings.pdf. ———. 2018b. ‘Vital_Statistics_Report_Births_and_Deaths_2016.’ 2018. http://www.bos.gov.ls/. Lesotho Meteorological Services. 2007. ‘Lesotho’s National Adaptation Programme of Action (NAPA) on Climate Change’. https://unfccc.int/resource/docs/napa/lso01.pdf. ———. 2017. ‘Lesotho’s National Climate Change Policy 2017 – 2027’. Lesotho: Ministry of Energy and Meteorology. http://www.gov.ls/gov_webportal/important%20documents/National%20Climate%20Change%20Policy%202017-%202027.pdf. Ministry of Health and Social Welfare. 2016. ‘National Health Strategic Plan NHSP 2017 – 2022 (Final Draft)’. Maseru, Lesotho: Lesotho Ministry of Health and Social Welfare. http://www.nationalplanningcycles.org/sites/default/files/planning_cycle_repository/lesotho/lesotho_revised_nhsp_2017-22_final_draft1.pdf. Morgan-Jarvis, Louella, ed. 2018. ‘Healthcare’. In Lesotho Review – An Overview of the Kingdom of Lesotho’s Economy – 2018 Edition, 2018th ed. Umdloti Beach, KZN, South Africa: Wade Publications. http://www.lesothoreview.com/digital-edition/. UNDP. 2017. ‘Lesotho Country Analysis Working Document Final Draft’. http://www.undp.org/content/dam/unct/lesotho/docs/Key%20Strategic%20Documents/Lesotho%20CCA_Final%20Draft_22%20September%202017_rev.pdf.